Mecanoo and Gispen envisions ultra-flexible trains of the future for the Netherlands. Trains are an integral element of a commuter’s daily routine. Noticeably the most popular mode of transport in Europe, trains are where people spend a considerable amount of their time daily. The Netherlands, as usual is the forefront country that has decided to make some progress surrounding the future of train transportation. The Dutch National Railway Company recently unveiled a series of flexible and modular train configurations that could to adapt to the countless ways commuters like to sit on trains. 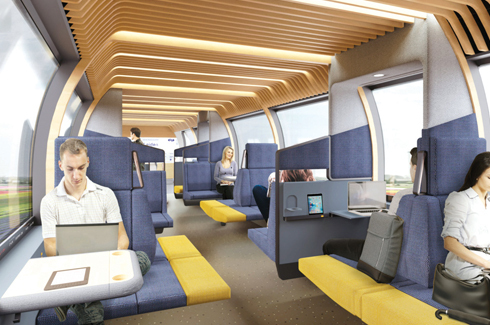 The company chose Dutch architecture firm Mecanoo and furniture company Gispen to collaboratively develop an idea of what its trains could look like by 2025, and the result may impact the future of transportation. 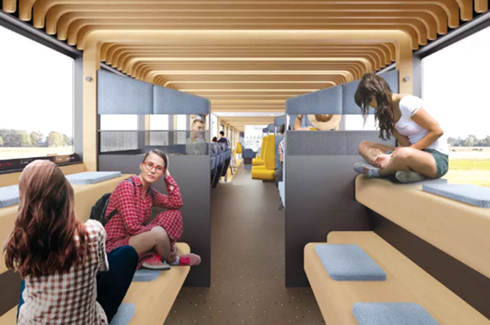 Their goal was to design a train that not only serves a method of transportation, but one that could also be a lounge, office, and space where travellers can enjoy their ‘own time’, rather than solely wait until they arrive at their next destination. As a result, the train interior design concepts are meant to be flexible to accommodate train passengers’ preferred environments and activities Mecanoo and Gispen conducted research regarding train passengers’ activities, and they determined that there are six different types of activity zones that passengers prefer, varying from “open and social” to “private and concentrated.” By designing 12 different furniture modules, Mecanoo and Gispen were able to propose a train configuration that facilitates each of these zones. Most importantly, the firms have created a space where every traveller can find a comfortable place to sit custom tailored to their activity, group size, needs, and travel time. For example, along with the classic two-seat configuration are a U-shaped group of seats that surround a foldable table, single seats that come with a desk, and even a multi-tiered bleacher seating design. The different layouts of the train’s interior make it appear open, comfortable, and hospitable to people from all walks of life. 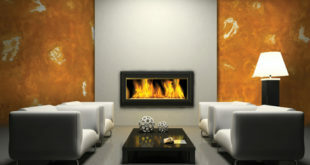 The fabrics are reusable and the module compartments can be disassembled and reconfigured with ease. While the designs are still in their conceptual phase, the project seeks to eventually become real and reinvent become into a comfortable, pleasant, and an efficient experience.